“The more you have the more you have to have to take care of the things you have.” Quote from a kids’ radio show we listened to when our kids were young. One of my retirement activities is walking. It’s always been at least a small part of my fitness routine but I’ve been walking more since I have extra time on my hands. I love walking as it gives me time to think and relax, two things I couldn’t find enough time for during my working years. Walking also gives me the chance to notice and observe — to watch what is going on around me instead of simply getting to the next thing as quickly as possible. One thing I notice regularly is cars parked either in front of a house or in the driveway. You won’t believe how many people do not park in their garages. I used to think that they simply had more cars in their household than garage stalls (i.e. if a couple each has a car and they have two kids who each have cars, someone’s going to be outside since there are no four-stall garages in my neighborhood). But that doesn’t mesh with what I see. I often see three or four cars parked in the driveway or on the street. 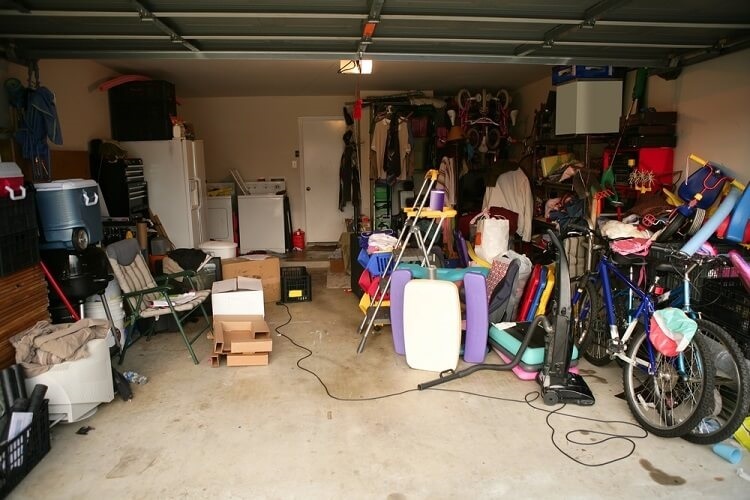 And when I get to see inside people’s garages (when they have them open for one reason or another) I find that the reason they don’t park in the garage is because it’s full of stuff. And “stuff” is a nice word. It’s really a combination of items in “ok” to “bad” shape. I wouldn’t say it’s junk, but it generally doesn’t look useful, which is probably why it’s in the garage and not the house. I do see various combinations of cars and stuff too. Sometimes one car fits in a two-stall garage and the rest is stuff (in some cases, the car fits so snugly within the stuff that I can’t see how the driver gets out). Other times two cars are outside somewhere and the entire garage is clogged with boxes, old bikes, clothes, you name it. I can sympathize to a degree. We’ve had our own dealings with too much stuff. We’ve had two moves in the past few years. When we moved from Michigan to Oklahoma we purged a TON of stuff. We had 14 years’ of accumulated items in a house that had great (read “lots”) storage options in the basement. So we took the move as an opportunity to reduce our stuff to what we felt was just what we’d use. We donated (charities) or gave away (friends) all the rest. Less than two years later when we were supposedly down to just the necessities, we moved again from Oklahoma to Colorado. Somehow our stuff had grown and so we purged again. Most of what we got rid of was stuff we moved from Michigan that we just knew we had to have. But we didn’t use it. So we gave away boxes and boxes of stuff again. Thankfully there are charities in both Michigan and Oklahoma benefiting from our excess stuff. When we moved to Colorado, we bought a lovely, large home, but one that didn’t have much storage room (the basement is finished with only a crawl space for storage). This was really no problem as we had extra storage — in our garage. You see we had a three-car garage and only two cars. So why not use the third stall for storage? That said, there are a couple caveats. First, we only stored stuff in the garage that was “garage/outdoor stuff.” Bikes, lawnmower, tools, gardening items, grill pellets, lawn and plant fertilizer, garbage cans, etc. No washing machines or TVs. Second, we only used about one-third of the last stall. It wasn’t packed to the hilt like the ones I described above. All was fine until my daughter wanted the third stall for her new car. Now we needed a plan to deal with the stuff in the last stall so my daughter could have it. The solution seemed simple: get a shed. I’d always wanted one anyway and this seemed to be a golden opportunity to get one approved by the finance committee (i.e., my wife). We started looking at sheds online, visiting shed warehouses, talking to people about sheds, and so forth. By the time all was said and done, we found that to purchase the shed we wanted, level the ground around it, and everything else associated with the shed it was going to cost us somewhere around $3,500. Yikes!!! It was at this point we wised up. We cleaned out the garage and opened up the third stall by 1) giving yet even more stuff away, 2) storing some stuff in other areas of the house (we got creative), and 3) organizing the garage better so the remaining stuff could fit in the rest of the garage. In doing so we saved ourselves almost $4k!!!! All of this is to say: I know how people can get sucked in to having too much stuff. Anyone want to guess the size of the storage industry? I’m talking about those places you see on Storage Wars where people rent garages to store the stuff they can’t use but don’t want to give away. I wondered so I went on a Googling trip around the web and found some very interesting stats about the storage industry. First, the forecast for the self-storage industry in 2016 is $32.7 billion. A mere six years ago it was $17 billion. Second, how about this as a fun fact: 9.5% of the US has a storage unit. Almost 10%! Let’s do some math. Slate says that the average stint of a storage unit rental is 15 months. Given that, a 10 x 20 unit (most popular we have cost data for) that rents for $150 per month (average of regular and climate-controlled) for 15 months costs $2,250. Multiply that by 9.5% of the population and you can see why the industry is so large. The NY Times points out that the reasons people use storage units is varied. Obviously there are some short-term, generally moving-related issues that call for the use of a storage unit. But if the average is 15 months and all the movers are using units for 3-4 months, imagine how long the average non-mover is renting a storage unit. Probably two years or more. If you’ve moved into a smaller home, but feel the need to keep the dining-room set that doesn’t fit in your new abode “just in case,” you’ve probably considered paying for extra storage space. Unfortunately, keeping that outdated dining set from 10 years ago can end up costing you quite a bit of cash. If you rent a 10×15 unit that’s on the low end of the national average — so, about $75 per month — you’re spending $900 per year on a unit. And that price doesn’t include any other taxes or fees the facility charges. Sell your stuff. Consignment shops, yard sales, eBay, wherever. Just sell it and pocket the cash! Give it to charity. You can deduct the fair market value of the items you give to a qualified charity. Be sure to record each item given away with an approximate value. Ask for a receipt when you donate, staple the receipt to the list of items donated, and put it in your tax file for the year. It will then be handy when you go to do your taxes the next year. Make a business out of your stuff. This is an advanced tip, but believe it or not there are people who make their living by buying unwanted stuff and then selling it for a profit. Check out The Scavenger Life for one example. Now it’s your turn. I’d LOVE to hear from ESI Money readers on this topic. What are your thoughts on Americans and their obsession with stuff? Anyone out there find that it’s a constant battle to keep the stuff down? Anyone rent a storage unit? Why? I plead Guilty. We also have way too much stuff yet half of it is my sons who have hobbies also. One son has a nerd cave where he collects old video gaming systems. He buys at garage sales, keeps what he does not have in his collection and sells the rest on ebay. It occupies a 10ft x 10 ft area in the basement. Another son has metal working equipment in the garage occupying the same amount of space. Then there is me who had a full woodshop and stained glass shop in the basement 10 ft by 20 ft. My future retirement hobbies. Wife has her summer clothes and winter clothes storage areas, Christmas decorations and don’t forget when they come home from college there are bins and microwave and mini fridge. Garage has lawn equipment, wood for woodworking and bikes and gas grill and is so small that there would be no way two cars could fit in even when empty. However I refuse to get a storage unit as they are a waste of money and yes I would like to purge some stuff out of the basement. But as there are 4 still living in the household I am only 25% of the problem. I am afraid that if there is new space opening up that it will be filled back up with new stuff from the other 3. My current strategy is you can’t buy it because we don’t have the space. We can only park one car in the garage, but that’s not due to stuff. Some stuff is there, only because that half of the garage isn’t even deep enough to park a car longer than a Miata (less than 16 feet). Growing up I was fortunate to have parents & relatives who were frugal. I learned from them. Thus I really do not have a lot of stuff to the point I cannot use my garage. I only have a one car garage. The only storage challenge I have is for the wood for our fireplace & wood stove located in our basement. But that gets used to help with the heat in the winter. I do have some some “stuff” I need to remove. I have outdoor Christmas decorations which light up that I no longer use. I stopped when the electric bill was way out of wack after the Holiday. I still decorate–I just do not light it up. Also since my home is hidden back from the highway, it made no sense to “light ” up if no one would really see it–not even me. I was inside. I do have boxes of children’s games & toys I have saving-hoping for grand-kids–but I do not see that happening any time soon. So I have been thinking of Purple Heart or Salvation Army or Good Will. I do have some old computers I’ve replaced over the years. I only have been holding on to them because of the hard drives. But I may be taking out the drives and recycling the rest. Most of the “stuff” is things I think I might reuse or re-purpose. I do that quite a bit. I like being creative and finding new uses for things. But I do get rid of things after a time frame like 1-2 years if I can’t use it. Once retired, I am finding that minimalism is where I want to be. Life is not about the things. It is about time, people, and experience. And by not spending money on stuff–you have more to spend on things that matter. My husband has been eyeing sheds for the last two years. I even found a brochure on the counter once. The finance committee at our house has declined his request. Our garage has vehicles (and a boat), but also contains tools, bikes, lawn mower, etc. So, we really don’t have any stuff in there that doesn’t get used, but he did reorganize lately and sold a few things on Craigslist (to the tune of $200+), which freed up space and put a little cash in our wallets. I love selling stuff! We paid $75 for a nice recumbent bike on Craigslist 5 years ago, used it to recover from a knee injury, and just resold it yesterday…for $75. Cost of use? $0. I love when that happens! I recently did they with a concept 2 rower and my wife actualy bought a used stroller used if for 2 years and then sold it for slightly more than we paid for it!!! Proud to say we have a tiny garage that barely has enough room for both cars, and we still have some extra space for storage. But we need to clean it out – I put some stuff in our attic last year because garage was just getting too nuts, and I swore it was my goal to never put stuff up there, but we ran out of space inside our tiny 1000 sq foot house. Also my parents made me take some crap from home. That said, we still have 2-3 empty cabinets after five years living there, so not bad!! Also re: public storage: I once worked with a woman who got so many wedding gifts they literally rented out a storage space for it. 2 years later, she’s still paying for it and they have never once gone through it! With home ownership declining in the US, currently at 62.9% from a high of 69.2% in 2004, I have actually thought about buying into some storage companies. It seems like people are allergic to getting rid of things so I thought it might make sense with the trends to buy. But we’ll see if it makes sense after some more analysis. I’ve actually considered that myself. Let me know if you proceed and how it works out. When I moved overseas my first job paid for my moving expenses and the monthly fees for a storage unit. After two years I moved on to another job and then went back to the storage unit, realizing that I never even thought about the stuff kept there. Needless to say, it was easy to give the items away to charity or sell a few pieces at nearly nothing. There is something to be said about not using stuff for a while and then passing it along instead of continuing to store it. Books – at one point, my wife and I envisioned a ‘library room’ and accumulated thousands (right?!?!!) of books. We rarely re-read any of them, or referenced them, and gave/donated all but 100 paper books. They weighed thousands of pounds, and would be expensive to move (probably cost more than they were worth). With Kindle now, we are able to acquire any books we want to own. Public libraries are great for this, too (same goes for movies, no need to acquire DVDs when streaming/cloud is so cheap and readily available). Collectibles/Music instruments – we kept telling ourselves we would play music again ‘someday’, and pass along collectibles to…um…somebody. Facing the truth, we divested and have not regretted it. We took pictures of them, because while apparently worth $9K for reselling, the sentimental value was much greater. Heavy equipment/tools – bought a used stump grinder for $1,400, sold it three years later after removing 200+ stumps, for…$1,400. Like Amanda, above, cost of use was zero. Basically cheaper to rent the heavy machines and equipment, instead of maintaining and storing it for a “maybe” years in the future. I LOVE that you rent out part of your house!!!! Have you ever written a post on that subject? I have written a few but stopped once the crazy people on my HOA board decided to send me letters about not renting out space. So Amanda and Hans are officially my chosen family and Cousin Dean is living upstairs if anyone asks (our board gaming friend who is a trucker that we’ve known for 7 years who just moved in a few months ago). Hans and Amanda were also met through board gaming. They asked to rent a room from us for 6 months in April 2012…they just never stopped. Current plan is to move out next summer (she’s a teacher now…they’ve both graduated from college since moving in with us and he’s a licenced paramedic and she’s a 1st grade teacher). I have a post I’ve been meaning to write on renting out your home. I think you just gave me an awesome example!! Glad I could help! Be sure to mention that you can pretty easily find acquaintances instead of strangers just by letting your support network know that you’re looking for a renter. But also, in our last house, we rented to two different guys that we did find via Facebook (one after the other). That worked out fine too. Obviously friends have pros and cons. I literally say “I’m taking off my friend hat…” before I have to lay down the law on stuff when they start slacking (they are slobs that have to keep it to only their personal space or else…) But we seem to make it work really well and even have movie nights together in the media room, share food when we make alot, pick up stuff from the store for each other, and even watch each other’s pets when the other ones are away.